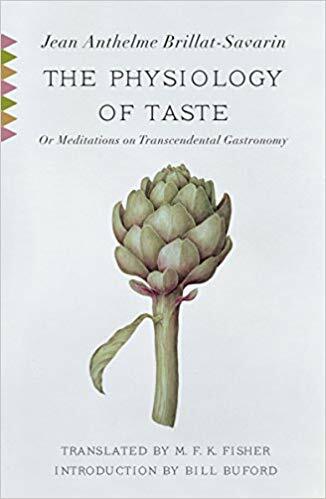 THE FIRST BOOK THAT ACTUALLY got me thinking about food as something other than tasty fuel with which to stuff my face was Jean Anthelme Brillat-Savarin’s 1825 work, The Physiology of Taste; or, Meditations on Transcendental Gastronomy. Part travelogue, part autobiography, part science text, Physiology deals with such pleasant problems as how to cook a fish that’s too big for the oven; the exacting method of digestion; why restaurateurs do what they do; how to survive a revolution; how to lose weight; and how to make the perfect cup of hot chocolate or coffee. The decision to lay the present work before the public, for their rejection or approval, left me with the simplest tasks to perform, no more, indeed, than the setting in order of a quantity of material long since gathered together: I had saved it up for an amusing pastime in my old age. When I came to consider the pleasures of the table, and all that relates to them, I early perceived that something better than a mere cookery-book might be made of such a theme; it became clear that so important a business, bearing so closely on the health, happiness, and everyday affairs of men, was deserving of broader treatment. ORL books Small Town Reporter Metaphysicatin' Jones Minute Mitzvah Jewishly film/vid Fictions synopsipitch moments jobbing ...wow. Torah: Input Ol' Thinkypants Lady Ann Pie bloggage Hey Fanboy! places learned RAW Learning Jewishly Tirebiter for Political Solutions Committee Being, Jewishly The Fabulous Adventures of Prosatio Silban -- the Cook For Any Price Stephen Colbert 365 Names Of God There's a God in My Soup reading cooking Media people Committee For A Bigger Universe It comix Sonoma creating PKD HPL haiku and environs Why I Love Words to Bring Back WIP dining Torah: Output Being News pithyism craft reviews PR skating past death First Graf 5 Thoughts writers arm's length "Bob"